What happens when a sinister Christian fundamentalist principal with political ambitions uses an elementary school as one more plank in his political platform? You get the attention of Derek, the most popular kid in school, his Harvard-bound girlfriend Maya, and the rest of his secular humanist pals, who fight for science and reason the only way they can: BY STAGING A MUSICAL! Join ETC for the show that haunts Michele Bachmann's dreams, and that forced the Pope into retirement! 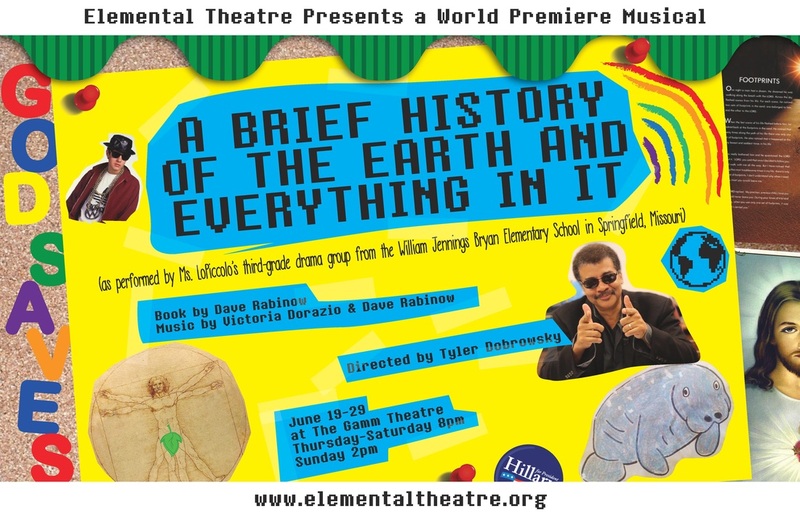 A BRIEF HISTORY OF THE EARTH AND EVERYTHING IN IT... runs for TWO WEEKENDS ONLY, Thursday-Sunday, June 19-29 at The Gamm Theatre, 172 Exchange Street, Pawtucket RI. Bring your program from A BRIEF HISTORY OF THE EARTH AND EVERYTHING IN IT...to the Wilbury Group's production of VEJA DOOLITTLE: LIVE IN CONCERT and get two tickets for the price of one at the door! Already saw VEJA? Bring your program to BRIEF HISTORY and get the same deal! More new musical plays than you can shake a stick at, for less money than it costs to park downtown! Join us after the performances on Sunday, June 22 and Sunday, June 29 (approximately 3:30 pm) for some FREE spirited post-show discussions, featuring leading local scholars in the areas of religion, politics, and performance and led by the Gamm's resident dramaturg Jennifer Madden, courtesy of the Rhode Island Council for the Humanities.